Encourage nurturing play with this adorable set of Big Eyes plush turtles. Both Mommy (or is it Daddy?) and Baby turtles have cuddly lime green bodies and darker green shells that are oh-so-soft to the touch. With big green eyes and sweet smiling faces, these stuffed turtles are out to inspire hours of imaginative, huggable fun. This soft and cuddly Big Eyes stuffed baby turtle, is bursting with personality and is ready for adventure. 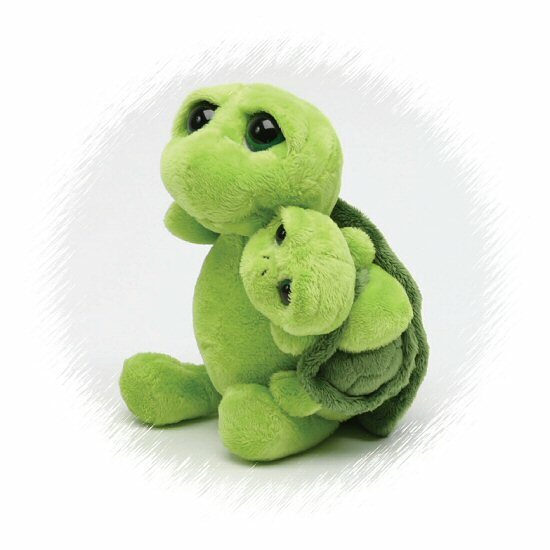 Snorkle is an adorable turtle stuffed animal with cuddly soft green fur and a sweet smiling face. This Dragons & Reptiles Bloco foam building set is an edutaining toy that builds spatial skills while promoting creativity.